Honda has revealed the all-new Jazz at the 2014 Paris Motor Show. It gets a 1.3-litre i-VTEC petrol engine with a choice of either a six-speed manual or CVT automatic transmission. Sales will begin in the UK in Spring 2015 and prices should start at around £11,500. Like the outgoing Jazz, the new model majors on practicality and comfort. It gets Honda's famous 'magic' seats, meaning the rear row can be folded individually. They can even be folded up, so owners can carry tall items like plants on the floor of the car. 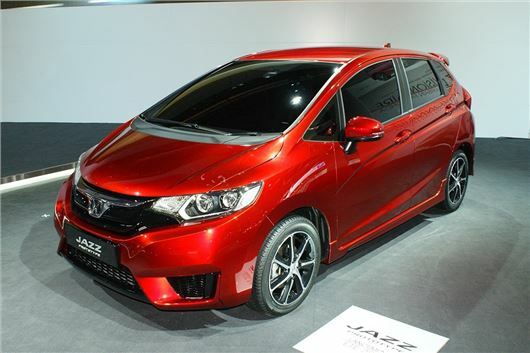 The new Jazz was launched in Japan in January this year as the 'Fit' and went on Sale in Thailand as the 'Jazz' in right-hand drive in June. It has also been on sale in China and in the USA in left-hand drive as the 'Fit' since early this year. Right-hand drive Jazz models for Europe are likely to be built at Honda's new plant at Tapukara, Rajasthan alongside the new Honda HR-V, with which it shares its floorpan and 'magic seat' interior layout. The company states that "as part of Honda's ‘small series' range, the third generation European Jazz will be built on the company's global compact platform. It will retain the centre fuel tank layout that is already found in the current model, as well as the Civic and recently-announced HR-V."
What about the new 3 cylinder 1.0 litre engine Honda were supposed to be putting into the new Jazz?